The ice in the Artic is melting away at a record-breaking rate opening up new possibilities for shipping routes. Measurements taken in August 2012 found the levels of Arctic sea ice were at their lowest levels since satellites began measuring the ice in 1979. In 30 to 40 years, it is quite possible that there will not be no summer ice at all. This has led to an increased interest in shipping in the Arctic. New shipping routes opening up due to the melting ice could cut shipping times between Asian and European ports by up to a third. 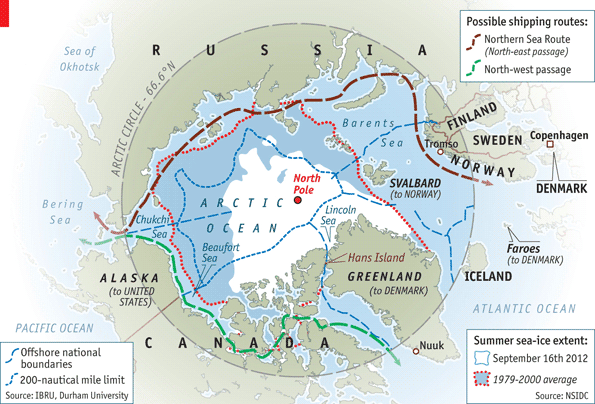 It is possible that the first commercial trade voyage could take place as early as summer 2013 led by China, and the potential value of goods travelling the new Arctic routes could become highly significant. China has been taking a strong interest in the region over the last decade, building a physical presence and using diplomacy and trade ties to engage in the region. The Chinese ship Xue Long (Snow Dragon) 雪龙 became the first ship to sail the Bering Sea after crushing the ice across the Arctic Ocean in August 2012. The icebreaker sailed all along the Northern Sea Route into the Barents Sea and returned by sailing a straight line from Iceland to the Bering Strait via the North Pole. China has also set up a multidisciplinary research base with 18 researchers called the Yellow River Station on Svalbard the Norwegian archipelago (See map above) since 2004. The Xue Long 雪龙 voyage in summer 2012 was a culmination of China's research so far and a test of the Northern sea route to check out the feasibility of it becoming a new shipping route through the Artic that could link Asian and European ports. China has also recently commissioned a new 120m icebreaker ship to be built by a company in Finland to further its Arctic research. The rules of the Arctic Council state that only countries with territories in the Arctic can become full members of the Artic Council. Nevertherless at the biennial meeting of the Council on 15 May 2012 in Sweden, 5 Asian countries: China, Japan, South Korea, Singapore, India and Italy became permanent observers. China, sees itself as a “near-Arctic state”, and had been seeking to become a permanent observer since 2006 (it had previously has its application rejected three times). But this time with Iceland's support and with the possibility of China and Iceland setting up a new Arctic forum, the members of the Arctic Council decided to widen the Council to include their Asian counterparts. Interestingly, most of the new joiners were already observers on an ad hoc basis. The six new members will not have speaking or voting rights. But they will be able to influence decisions in the council’s six working groups with their expertise, research and potential funding of initiatives in the Arctic. China, for example, has led five marine expeditions in the Arctic since 1999, including the Xue Long 雪龙 voyage in summer 2012. Japan and South Korea may decide to conduct their research with their own icebreakers ships too. The new Asian observers will bring fresh new ideas to the Arctic region and advance the use of new faster trade routes between Asia and Europe over coming years. 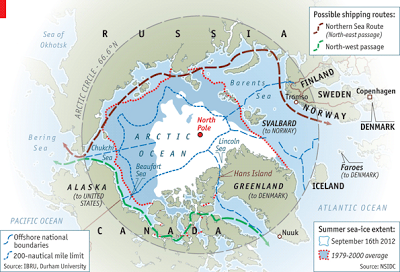 The Geo-Trade Blog will continue to follow developments in the Arctic. It is going to be interesting, and I hope ordinary people will be traveling to Antarctica. I was there in a expedition ship of this company https://poseidonexpeditions.com/ships/ last year. Fantastic journey!